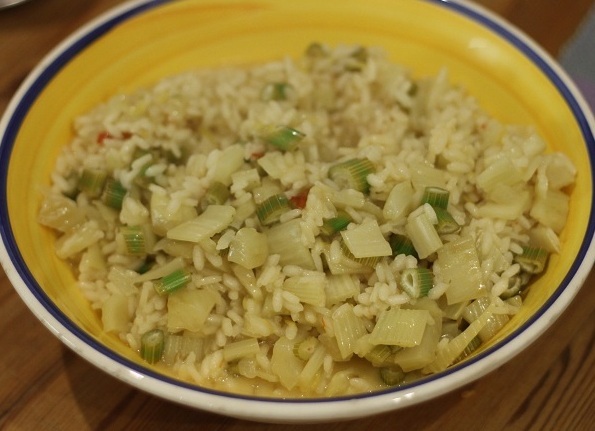 Yes, you have read that correctly – fennel and Vodka Risotto. I picked some Florence Fennel from the allotment today and knew instantly what I would cook tonight. I found the recipe a few years ago in the River Cafe Cook Book 2 by Rose Gray and Ruth Rogers. 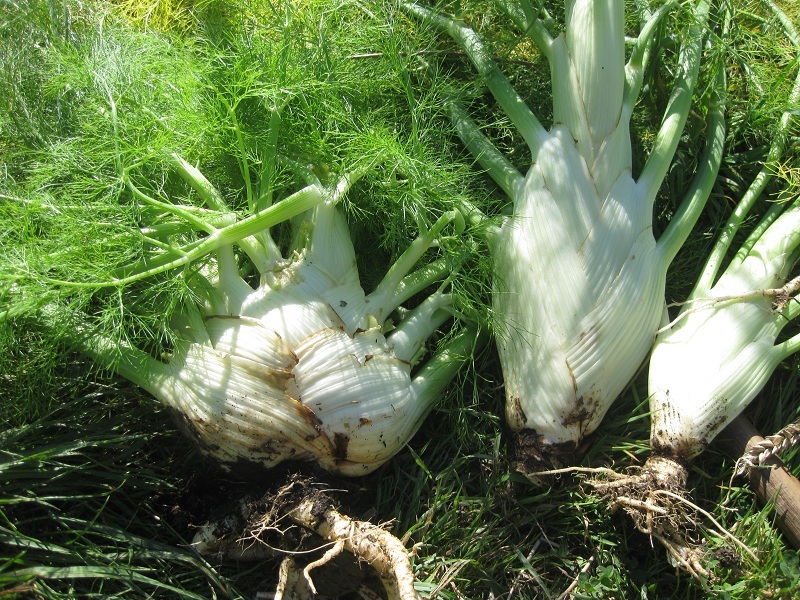 How could I resist a recipe that combined fennel, a favourite vegetable of mine, with alcohol? The first time I made it, I followed their proportions, factor in that we were also celebrating – we had a couple of glasses of champagne before eating; to say we were sloshed half way through dinner is an understatement. Pow! The alcohol content of the dish was spectacular, and by the time we finished eating, all we managed to do was stagger to bed, and pass out in a alcohol stupor. The original recipe calls for a double shot of vodka per person. Now I don’t know whether or not your liver has the skin of a rhinoceros, but mine doesn’t. Since then I’ve adjusted the quantities and can now remain sober when eating this dish. So I now make it using 1 shot of vodka per person – max. But it’s entirely up to you how lively you want to make it, and whether or not you have to get up to go to work in the morning or not. This risotto is superb, a real light summer meal. I love the combination of the aniseed flavour of fennel, mixed with zest and juice of lemon and a hit of vodka and chilli. Cook for a minute or two, add the fennel seed paste and cook it for another minute or two. 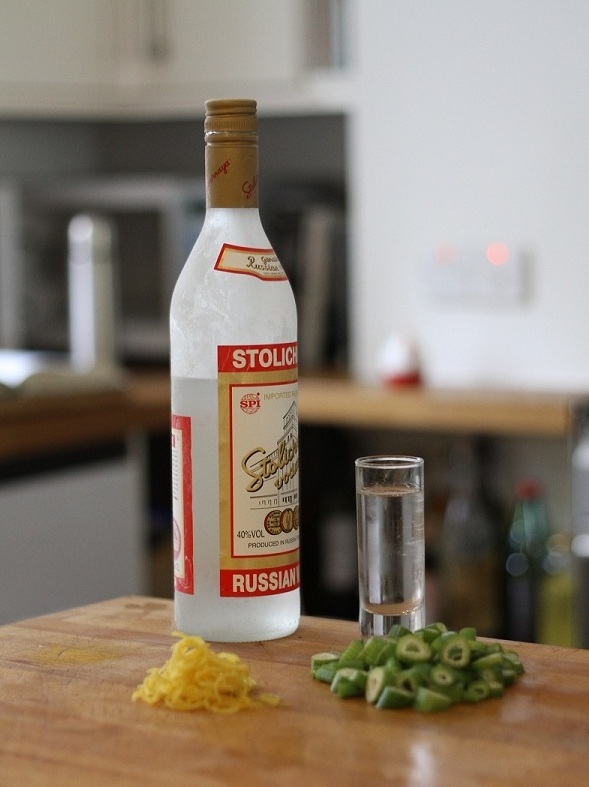 Stir in the remaining butter and add the vodka, lemon juice and fennel tops. And yes, I managed to go to bed sober this time! Gardening Notes ~ The Florence Fennel I picked was a happy accident of some self-sown/ seeded fennel grown last year for seed saving, and I may add, unsuccessfully so! It is larger than normal, and was starting to bolt, but I managed to tidy it up enough to eat. Previous Post Previous post: Aubergines, nearly, nearly….